The upcoming Baywatch movie, starring Dwayne 'The Rock' Johnson and Zack Efron, currently shooting on Tybee Island, Savannah, Georgia, where the HFPA recently interviewed the cast, is a reboot of the former TV series made famous by David Hasselhoff and Pamela Anderson. David Hasselhoff, 63, primarily known for his leading roles in the TV series Knight Rider (from 1975 to 1982) and Baywatch (from 1990 to 2001), has also joined the ranks of the headliner of such shows as The Simple Life, Gene Simmons: Family Jewels, Keeping up with the Kardashians and, of course, I Am Cait. 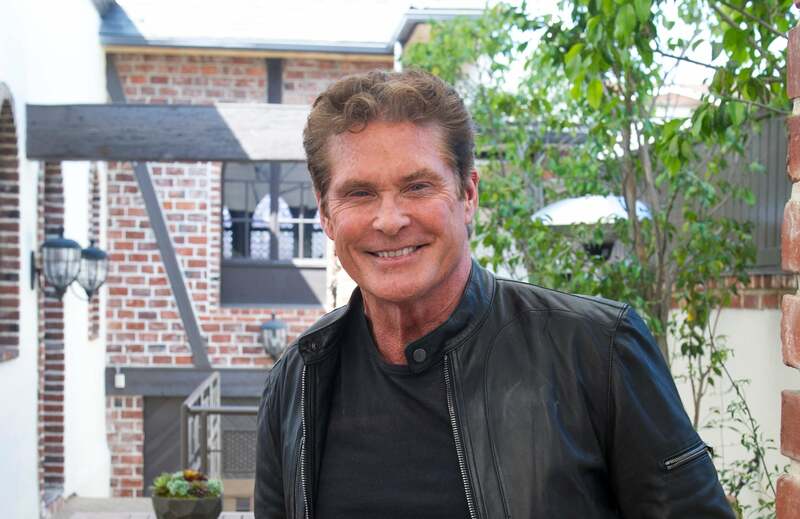 His new show, Hoff the Record, a mockumentary featuring a fictionalized version of him as he faces the autumn of his career, and in doing so, relocates to the UK in the hopes of reigniting his professional life. An enduring quality which sets Hasselhoff apart is his ability to be in on the joke when it comes to his cheesy persona, though it must be said, he takes his acting career seriously. This self-deprecating, fly-on-the-wall format (think Lisa Kudrow’s Comeback), was once thought of as a short-lived fad but has instead become a bonafide sub-genre of Reality TV. Stars, who once guarded their private lives, often lamenting their loss of anonymity, now cash in on their foibles. “I'm not just The Hoff, I'm an actor,” he says. As evidence of his thespian endeavors, he has two film projects on the boil: Sharknado 4, starring alongside Gary Busey and Cheryl Tiegs, and he will also appear in the highly anticipated Baywatch reboot. Dwayne Johnson takes over Hasselhoff's role as veteran lifesaver, Mitch Buchannon, and also stars Zack Efron, Alexandra Daddario and Kelly Rohrbach. Hasselhoff says, “When they first approached me about the Baywatch movie, I said, 'If the part was good and the show wasn't stupid, of course I'll be in it.” Evidently, the script was to Hasselhoff's liking. Consequently, he's been shooting on Malibu beach, the very place where Buchannon would sprint into the ocean (in the TV's favored slow-mo effect) to save endless drowning victims and put a stop to various ne'er-do-wells running amok in Southern California. He says of working with the revamped Baywatch cast, Johnson and Efron, “They're really nice guys and we're having fun working together. I think they realize they're stepping into a great franchise,” he says. Hasselhoff would know something about that. As one of the producers, Hasselhoff made in excess of $100 million. The series was watched by almost 1 billion viewers and aired across 140 countries. The film is produced by Golden Globe nominee Ivan Reitman and directed by Seth Gordon. Hasselhoff says his role is under wraps, though the premise of the film is centered on earnest lifeguard Buchannon who clashes with his new partner; hothead upstart Matt Brody, played by Zack Efron, formerly played by David Charvet in the TV series. Hasselhoff remains one of the world's most recognizable faces. Refreshingly, unlike many celebrities, he doesn't bemoan his lack of privacy. “Oh my God, that is so ridiculous when actors complain about that,” he says. “You should be honored that anybody wants to take your picture, and you should be honored that anyone bothers you. The time to worry is when nobody takes your picture and I have seen it happen a million times, to everybody, but before that happens they can get so stuck up and full of themselves.” Case in point, when he left the Hollywood Foreign Press offices, he jumped onto the TMZ bus for a not-so-impromptu interview with Harvey Levin.